It’s no secret how dangerous certain toxic paints can be. Usually, the paint that causes the most problems is lead paint, which was banned for use as a household paint back in 1978. However, even newer household paints can emit certain unhealthy volatile organic compounds. Many of the paints that people use for the construction or remodeling of their homes can cause serious health issues, especially for young children. We all would like to think that advances in technology have yielded new kinds of non toxic paint. While that may be true, one of the safest types of paint available has actually been around for hundreds of years. This is non-toxic casein paint. Casein paint, or milk paint, was originally made from raw organic materials in Ancient Egypt. It takes its name from the milk casein that makes up its primary ingredient, a substance that gives the paint great tenacity and makes it a great wood finish. 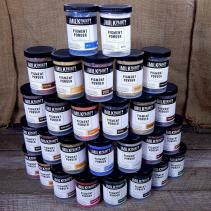 Modern milk paint is made from purified milk protein, lime, and other natural fillers. The pigments are harvested using traditional techniques and are free of lead, radioactive materials and other substances that may be harmful to the environment or your family. The paint itself comes in a water soluble powder, which allows users to control its viscosity. The paint dries to a matte finish on most surfaces and can be used for various art projects as well as home improvement. It should go without saying that a family’s home is an important investment. It should be kept safe of any toxic fumes or substances. While most paints are certainly safer than they were a few decades ago, many of them are not perfect. If you want a safe, non toxic paint that can provide a pleasing matte finish to wooden or masonite surfaces, you owe it to yourself and your household to consider a high-quality milk paint from our company.